The largest economy in the world in 2010, depending on who is measuring, is either the US or the EU. It is seen as an inevitable fact that China with its 1.3 billion headcount and its rapid growth pace will be the world’s largest economy at some point in this century, and certainly by 2100. Having a local view of Moscow, and to some degree of Russia, I see enormous potential for this country. Given its intellectual wealth, strong innovation ethics, and the country’s raw resources, there is no reason why this country could not have been the world’s third (after US and EU) largest economy in 2010 were it not for the setback of the 1917 revolution. Despite Russia’s present-day quirkiness – namely lack of transparency, a ruling class that is more self-interested than out for the good of Russia, and poorly distributed resources – the country is transforming for the better. Corruption will abate significantly if the transparency issue is fixed. This will lead to a more competent government, better distributed resources, and faster progress and economic growth. Whether the European Union will stay intact has major implications for the shape of the world in 2100. Recent EU economic strife, expressed by the inflexibility of the Euro in Greece, Spain, and Portugal and dependence on aging German savers to fuel the spending habits of younger citizens in the southern part of the Union, has put strain on the European fabric. If internal discord dismantles the EU, world poles of power will be China versus a union of convenience between the US, Japan, India, and Russia. These four nations will be joined mainly to nervously monitoring the ambitions and actions of the Chinese, and curb them where possible. However, if the EU stays intact, as it is the US’s interest, the poles of power will be China versus the West (US and EU) with occasional partnership with Russia and India. Indeed, Russia and India may become more tightly integrated with the West, but doing so will come with considerable internal debate over the identities of these two nations who seem themselves as singular, sovereign, and not Western. 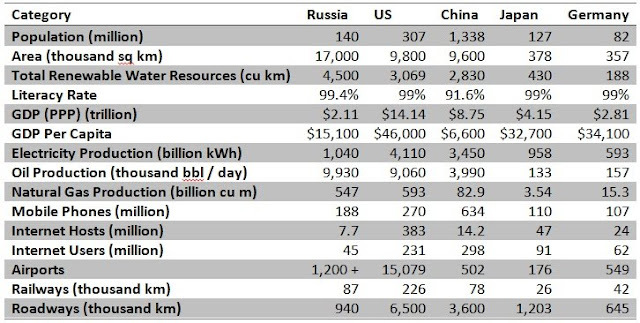 In any case, here are some numbers that speak to Russia’s potential in the coming century. Note Russia’s abundant human capital and natural resources, its resource and per capita infrastructure advantages over China, and its growth potential advantages over Japan and Germany. Hmmm...I think you are overly optimistic in your "world power" rankings. In 1910, the US was still a very minor actor on the world stage, yet by 2000 was already well past its acme and definitely fading. I would believe your projections to be more accurate had you made the prediction date to be 2050. But, for either date, it's hard for me to see the EU as a major power. IMHO, the EU is perched atop a flimsier house of cards than even the US. I think it more likely to have degraded (economically) somewhat by 2050, whether it keeps the U or not, though I suspect you are right that keeping the U will do it better than dropping the U. As to which will be top dog in 2100, I think China has at least a 50-50 chance of having spun into chaos by that far out. Too many people (I perceive) there are living in virtual slavery. At some point it will all come apart.